Choosing the best summer swimwear can sometimes be the last thing you want to do before your holiday, right? And guides intending to help you find the perfect swimwear style, all linking back to your body type? Those can often be even harder to stomach as they disuade rather than persuade you to go for the styles you’ve had bookmarked for months. As the swimwear market expands to cater for all – slowly but surely – options in all shapes, sizes, colours and support are there to make sure you get to wear exactly what you want. No matter the number on the label. There is one rule to follow, though. Fit. Your swimwear must fit you. It’s really no good wearing a piece – no matter how fabulous – if it simply does not work with your body. Ill-fitting pieces will not only leave you feeling uncomfortable, but it’s likely they will occupy your thoughts your whole holiday long. No, thank you. Order online but always try on. Do a few star jumps and practice your poolside pose to get a feel for how it will shape up no matter what you’re getting up to. Hold it up to the light to see how transparent it becomes – unless you’re going for that Kendall Jenner summer vibe you definitely want to check this out. Not many of us are able to get away with wearing a perfect set straight up, as most of us need a different size for tops and bottoms. Mix and match until you heart is content to come up with a swimwear formula that is all your own. 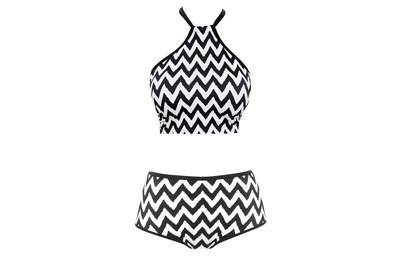 Cross-back bikini top and bottoms, both £22.50 at Championstore.com. High neck crop top, £42, and shorts, £26 at FreyaLingerie.com. 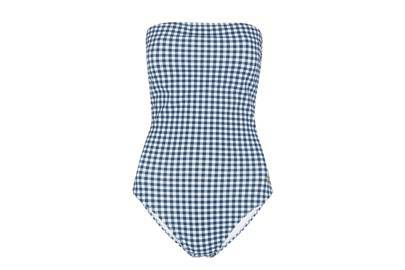 Gingham swimming costume, soon at Whistles.com. Floral swimsuit, £99 at TedBaker.com. Baroque print bikini set, £36 at ASOS.com. Smocked bandeau bikini, £215 at HeidiKlein.com. Frill top and bottoms, £34 at Topshop.com. Logo bikini, £91 at Topshop.com. Ruffle bikini top, £60, and bottoms, £40 at TedBaker.com. 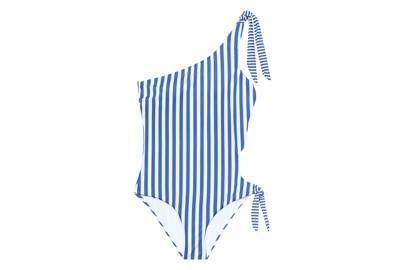 Money bikini, £110 at Ganni.com. Red frill suit, £32 at Next.co.uk. White spot bikini bralet, £22, and bikini brief, £12 at Next.co.uk. One shoulder swimsuit, £25.99 at Tezenis.com. Bikini top, £30, and briefs, £18 at BouxAvenue.com. 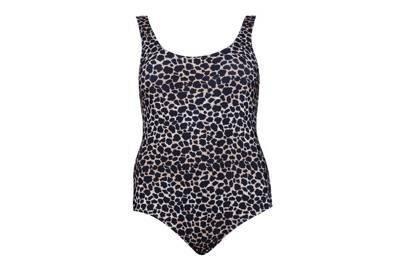 Animal print swimsuit, £18 at Boohoo.com.